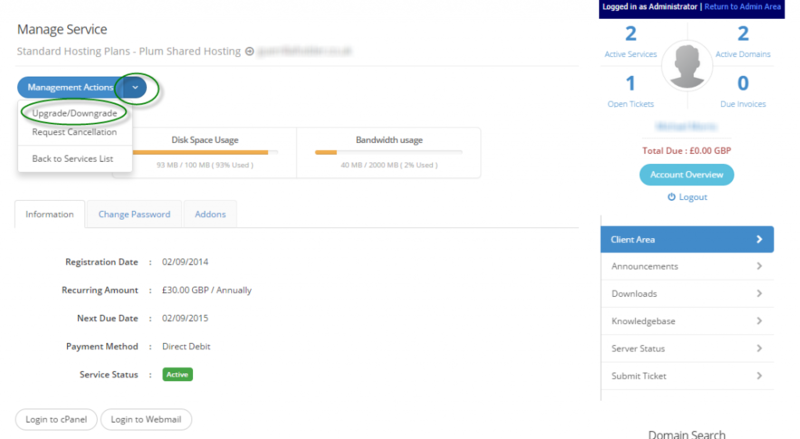 To upgrade or downgrade your existing hosting to a smaller or larger plan, first log into the client portal using your email address and password. The choose “Active services” from the client portal homepage to list all your services you have with us. Choose the service that you want to upgrade, then select the arrow next to the “Active” status indicator. On the manage service page, choose “Upgrade/Downgrade” from the Management Actions menu. You can then choose from a list of available packages to upgrade/downgrade to. Select the menu next to the price to change the billing period from monthly to annual or biennial. This will then create an invoice based on the pro-rata amount between your existing plan and the new plan until your hosting plan renewal date. Once you pay your invoice, your upgrade will be applied automatically.